The fight for survival in National One has come down to the final two weeks of the season as both Hull Ionians and Blaydon set their sights on victory this weekend as they bid to avoid the drop. In Round 27, both of the main relegation candidates secured wins which means that Hull Ionians are now two points clear of Blaydon heading into tomorrow. The I’s host Old Albanian while Blaydon welcome Rosslyn Park to Crow Trees looking to leapfrog Hull if there is any slip-up by the Yorkshire side at Brantingham Park. Hull Ionians cannot be relegated this weekend, but Blaydon can be. If the north-east outfit lose to Rosslyn Park and Hull beat Blaydon, then Mickey Ward’s men will be plying their trade in National Two North next season. It isn’t just Hull Ionians and Blaydon who can still be relegated. 13th placed Fylde are not out of the woods just yet but three points from their final two games of the season will be enough to save Paul Arnold’s side. At the right end of the table, Hartpury College will be aiming to stay unbeaten this weekend when they host Macclesfield as they look to complete the season without suffering a defeat while second place can be wrapped up tomorrow if Plymouth Albion beat Blackheath. Elsewhere in National One this weekend, Ampthill and District host Cambridge, Birmingham Moseley travel to in-form Esher and Coventry welcome Darlington Mowden Park to the Midlands. Following the Easter weekend, this miraculous season for Hartpury College continues this Saturday as they take on already relegated Macclesfield in their final home game of the campaign. College’s year has been nothing short of remarkable and a bonus-point win in Gloucestershire this weekend would seal a perfect home record for John Barnes’ side. The newly crowned champions are aiming for 15 straight bonus-point wins on their own turf and if they were to achieve that feat, then it would leave Hartpury going into the final day of the season still with the chance of an unbeaten campaign. For now, College will just be focused on the task in hand against Macclesfield tomorrow, but they are strong favourites to become ‘invincible’ this term. With Hartpury having secured the league title and Macclesfield having already been relegated, many may think that this game is a dead rubber, but that isn’t the case especially in the Macclesfield camp. The Blues had their fate sealed at the start of the month, but the divisions’ bottom club have certainly shown improvements since then. Last time out, Giles Heagerty’s men beat Blackheath after they were narrowly edged out by second placed Plymouth Albion so they take the trip to Hartpury this weekend looking to continue their recent positive performances as they aim to end their time in this division on a high. Plymouth Albion can officially secure second spot in National One this weekend if they pick up one point or more from their trip to Blackheath. As things stand, Albion are 10 points clear of their nearest challengers, Ampthill & District, and you wouldn’t bet against Kieran Hallet’s side wrapping up the silver medal spot tomorrow. Albion have been in scintillating form over the last couple of months and they head to Well Hall having won their last 11 matches. It is clear that Plymouth will be challenging for promotion back to the Championship next season, but their immediate focus will be to clinch second spot this weekend. In terms of Blackheath, their season has really tailed off since January. Before the end of 2016, ‘Club’ were challenging towards the top spots in the division, but 2017 has been a year to forget for them so far. They currently lie seventh in the table having won just one of their last nine matches which is way below the standards we are used to from Blackheath. They will be keen to end this season strongly ahead of James Shanahan’s arrival in the summer and a first home win in just over three months would be the perfect start to ending this campaign on a positive note. Third placed Ampthill and District welcome Cambridge to Dillingham Park this Saturday for their final home game of the season. The A’s are still in the hunt for second place, but they know that they cannot afford any more slip-ups otherwise any hopes they have of finishing in the silver medal spot will be over. In truth, it has been another strong campaign for Ampthill who are on course to better their achievements of last year. A bonus-point win this weekend would see the Bedfordshire side match their points total of last season (103) and with them having lost just three times at home all season, Ampthill will be confident of clinching a maximum win tomorrow. Cambridge take the short trip to Ampthill this weekend with Head Coach Ross Stewart looking to experiment with his side in these final two games of the season. The Blood and Sand have suffered back to back defeats against relegation candidates Blaydon and Hull Ionians and Stewart stated last week, that a change in game plan may be needed if they are to end their season on a high. Considering Stewart took over the helm at the start of this campaign after Rowland Winter had guided them to promotion from National Two South, Cambridge should be pleased that they have secured their safety in this division at the first time of asking. The men from Volac Park will now be aiming for their first ever win at Ampthill tomorrow as they look to end a run of just one victory in eight matches. I think it is fair to say that Birmingham Moseley have been planning for next season for the last few weeks. The side relegated from the Championship last season saw their hopes of a top two finish come to an end last time out as they were beaten by Hartpury College and the Midlands outfit will now be focusing on a promotion challenge next year. With Head Coach Kevin Maggs departing and Richard Protherough joining the club at the end of the season, the new Director of Rugby has wasted no time at all in putting his plans in place as he has already recruited nine new players. However, Maggs will want to finish his six year tenure on a positive note and wins against Esher and then Fylde in his final game at Billesley Common would be the perfect send off. Birmingham Moseley currently sit fourth in the table while their hosts this Saturday, Esher, occupy 11th spot but it is the home side that are in better form coming into this encounter. The Surrey outfit began this year with just two wins from seven matches and they were sliding towards the relegation battle in this division, but over the last few weeks, the tables have turned. The men from Moseley Road have won four of their last five matches and head into this fixture on a three game winning run after victories over Old Albanian, Darlington Mowden Park and Loughborough Students. It has been a strong end to the campaign for Esher and they are now just a bonus-point win away from a top half finish which may well be a target for Ricky Nebbett’s side over the next two weeks. Coventry will be aiming for their seventh victory on the spin this weekend as they welcome Darlington Mowden Park to the Butts Park Arena for their final home game of the season. Rowland Winter’s men currently lie in fifth place in the table and their strong campaign has mainly been down to their performances on their own turf. Cov have won on 18 occasions this term and 13 of those victories have come at home. In fact, the Midlands side have lost just once all season in front their own supporters – that coming against Hartpury College at the beginning of October – so they will be oozing with confidence this weekend as one of the form sides in the league look to continue their impressive recent run. In their last outing, Coventry thrashed Old Albanian 73-8, with Darlington Mowden Park beating Fylde 66-22 so expect a few points to be scored this weekend in the Midlands. DMP occupy eighth spot in the table as things stand having won 13 of their 28 matches this term with their only draw coming against Coventry back in December. DMP head into this fixture having won three of their last six games, but they have only won five times away from home this season. Their last triumph on the road came against Birmingham Moseley two months ago and the north-east side will be hoping to put that right this weekend as they aim for a top half finish. It was a bittersweet Saturday for Blaydon two weeks ago. After coming from behind in the final six minutes against Cambridge to clinch an all-important victory, the news filtered through from Rosslyn Park that relegation rivals Hull Ionians had upset the odds and beaten the London-based side. With both of the relegation candidates picking up victories, it now means that Blaydon sit two points behind Hull Ionians as we enter the final two weeks of the season. The north-east side are back at Crow Trees tomorrow where they have won on five occasions this term and they will know that they need to secure three points or more from this fixture if they are to avoid relegation this weekend. In truth, Mickey Ward’s men will just be focused on claiming a victory and after seeing Hull Ionians secure a win against Rosslyn Park last time out, Blaydon will know that they are more than capable of gaining their desired result this Saturday. However, Park will be itching for a response after that shock defeat two weeks ago as they look to keep their chances of finishing in fifth place alive. Park are now seven points behind Coventry so any further slip-ups for Rosslyn would end that ambition and they will also be keen to end this season on a high with Head Coach Andy Holloway leaving the club to join Blackheath as a Backs and Skills Coach. 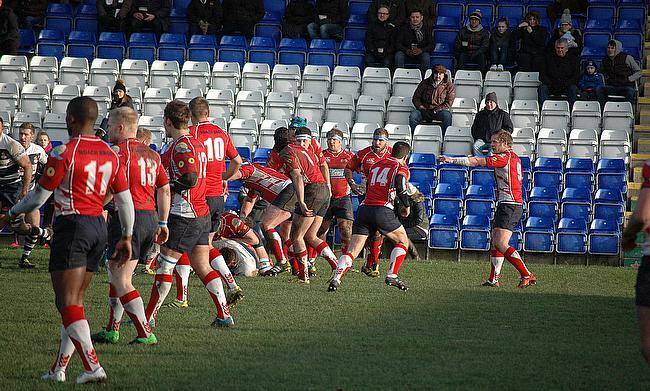 It is a long trip north for Rosslyn Park this weekend, but can they return to winning ways? Hull Ionians’ fate is in their own hands. Back to back victories over Cambridge and Rosslyn Park has left the Yorkshire outfit in the driving seat to avoid the relegation as we begin the final two weeks of the season. Their stunning win against Rosslyn Park last time out means the I’s are two points clear of the drop and their safety can be secured this weekend if results go their way. The men from Brantingham Park come into this clash with Old Albanian on a high and they know that if Blaydon lose to Rosslyn Park and they beat the OAs tomorrow , then they will seal their place at this level for a third successive year. The I’s have won six times at home this season and a seventh triumph in front of their own supporters could well be the defining victory of their season. Trying to halt Hull Ionians’ charge to safety will be Old Albanian. James Shanahan’s side have an agenda of their own as they aim to finish in the top half of the table after an impressive first season back at this level following promotion from National Two South last May. The OAs currently sit three points outside the top eight and with Shanahan leaving the club for Blackheath at the end of the campaign, finishing eighth would be a superb way to end his time at Woollams. Old Albanian have already announced that Bury St Edmunds boss Gavin Hogg will be their new Head Coach for next season, but for now, they’ll be focused on breaking into the top-half. Fylde require just three points from their final two matches of the season to confirm their safety in National One, but just two months ago, I don’t think many at Woodlands would’ve expected the Lancashire side to still be in with a chance of being relegated. Three straight wins lifted them side away from the battle for survival, but since then, Fylde have lost five games on the trot. They are eight points clear of the drop as things stand and it is unlikely that Fylde will go down, but they will want to overcome the Students this weekend in Paul Arnold's final home game in charge of the club to officially confirm their safety at this level. Overall, it has been a positive season for Loughborough Students this term. A side that usually finishes in the bottom six in this division are still in with a shout of finishing in the top eight, but they must turn around their recent form in these final two games of the season if a top half finish is a realistic aim. Students have lost eight of their last nine games and that is the reason why eighth place has slipped away from them. In truth, Loughborough have performed well in the majority of those matches, especially against Hartpury College, so Dave Morris will be hoping that his side can take the positives from their recent defeats and turn them into a victory in Lancashire this Saturday.